Historically, the former pit towns of England’s north-east have served as a breeding ground for ‘no nonsense’ hard men and Sunderland super-lightweight Glenn Foot fits that stereotype perfectly. The 30 year old former ABA finalist, known locally as ‘The Hammer’ has had as many scraps on the streets as between the strands and twice his promising career was almost curtailed by ‘out of hours’ skirmishes. ‘I’m from Marley Pots which has always been a real rough council estate. You had to learn to fight just to survive up there. There were a lot of joy riders and we used to fight the car thieves. I think I flattened every one of them!’ recalls the straight talking former Prizefighter titlist and English champion who has lost just twice in a 23 fight pro career that commenced in September 2010. ‘When I was about 13, an amateur boxing gym started up there and I joined with my brother Gavin and all my cousins. Gavin was national Golden Gloves champion and won a Six Nations silver. The Wearside warrior fought more than one hundred times in the singlet, captaining England on three occasions, but his professional aspirations were almost doused after just half a dozen starts. ‘In 2011, I lost my licence for fighting with a doorman at a boxing tournament at Seaburn. I was young and daft. You learn by your mistakes,’ says Foot who copped a suspended sentence and had his boxing licence temporarily revoked by the Boxing Board. After nine months on the naughty stool, contrite Glenn resurfaced to win the January 2013 Prizefighter welterweight tourney – pasting three unbeaten prospects en route – and, shortly after, rinsed Maesteg’s one time European lightweight champ Jason Cook inside seven rounds. However, on the cusp of a British title shot in December 2013, ‘bother’ reared its ugly head again. Foot explains: ‘Following a disagreement between two families, I had half my right arm chopped at with a machete. My wrist was also broken and the surgeon insisted that I’d never box again. Remarkably, within 20 months of the incident, this hardest of hard men found himself inside a British championship ring swapping slugs with Stourbridge strongman Sam Eggington for the 147lb crown…..albeit not at full pelt. ‘Initially, I was pulling back with the right hand and that affected us big time,’ claims Foot who lost a technical decision after bailing out with a cut at the end of round eight. A fistful of victories – including highly credible 10 round decisions over Kirk Goodings (11-2), Adam Little (17-1) and Philip Bowes (15-2) – led the Sunderland slayer to the English super-lightweight crown. However, in July he lost a game of tag (and his title) to the ultra evasive Gloucester switcher Akeem Ennis Brown on a 10 round majority. ‘Watching it back, I felt it should’ve been a draw but I’ve never met anyone so awkward,’ says Foot. 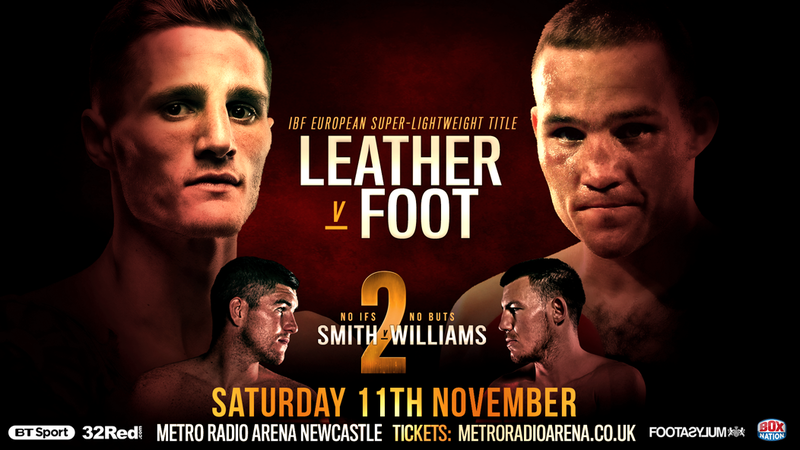 Now into his 31st year, Glenn knows he has to gamble if he is to fulfil his British title ambitions and this Saturday at Newcastle’s Metro Arena, he rolls the dice against Guisborough’s gifted Josh Leather (12-0) in a Tees-Wearside war that seems certain to deliver. ‘I’m motivated to prove that my name should be right up there where I belong along (Commonwealth king) Josh Taylor and (British boss) Jack Catterall,’ says Foot who will inherit Leather’s IBF world rating if he prevails.